Ever wished you had a magic button that automatically took care of things around the house for you? As of today, you have one. Not just one, in fact, but several. We've just added Scenes buttons to your Alarm.com app, giving you the ability to adjust multiple devices in your Alarm.com smart home with a single command. Update to the latest version of our app and you'll find four readymade scenes in your Alarm.com app: Home, Away, Sleep and Wake Up. Each scene is configured for a moment in the day where you need to adjust several things at once: arriving home, leaving the house, going to bed and getting up in the morning. All four scenes are easy to customize and add to. You can add a porch light to your Home scene for a bright welcome, or set your downstairs lights to turn off automatically when you tap the Sleep button. Just pick a name for your new scene—Dinner, or Kids Bedtime—then select the devices involved, specify what you want them to do, and add the button to your Scenes menu. It will appear at the top of your Alarm.com app, ready to use. 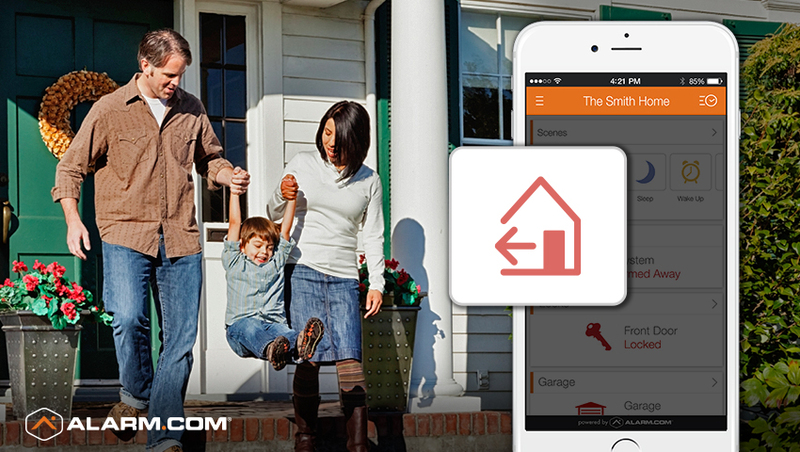 Controlling your home just got even easier with Alarm.com—the only app you need for your home. To find out more about Alarm.com's smart home security app, click here.